Posted by andrea tomkins in: Home/reno|Oh! Things! As I wrote about previously, we’ve been busy planting/weeding/chopping stuff down in our backyard. Mark trimmed some trees and took out a whole bunch of branches recently, which is great until you have to clean up/bundle up the aforementioned branches. Sigh. In these cases, it’s helpful to have an end game in mind. Which is: (a) to get ahead of the overgrowth and (b) slowly improve our outdoor space. This has all been rather slow going, so slow, in fact, that it’s taken 20 years to get where we are today. I wish I was kidding. I’ve been sitting here thinking about what I REALLY want for our backyard (other than a weed-free experience, of course). I would like our shed to be more organized, and maybe some better storage for our patio cushions, but that’s neither here nor there. As a good friend reminded me recently, it’s much healthier to focus on what we DO have instead of what we don’t have. She is right. For starters, we have a great back deck. We have a decent BBQ (natural gas, so no need for propane tanks! ), a new/old plant stand, a modular couch (which we got in 2009), a table and four chairs, and a chaise lounge. (1) A natural gas-powered fire pit embedded in our flagstone patio with some cozy seating around it. … but I was never able to find a string of outdoor “Edisons” that looked sturdy enough to withstand the shenanigans of those pesky Westboro squirrels AND were a good price. Also: I only ever saw incandescent bulbs. LED lights strings are almost always awful. And by awful, I mean cold and blue, the VERY OPPOSITE OF THE FEELING I WANTED TO CREATE. You these a lot at Christmas time. Unsuspecting shoppers buy them thinking they’re going to get something warm and twinkly that reminds them of their childhood but instead they end up with $150 bucks worth of icy glare that induces blindness. The package states that these are “commercial grade” and they aren’t kidding. This is a heavy, heavy-duty, thick black cabled string of lights. The bulbs are plastic by the way, which was disappointing for about 1.5 seconds until I banged the whole string on the ground and then another dozen times while hanging them. Did I mention they are heavy? Success! I love it. It’s hard to tell by this photo but they are actually pretty bright and really illuminate the whole area. I don’t think we’re quite visible from space, but the neighbours will know we are out there. 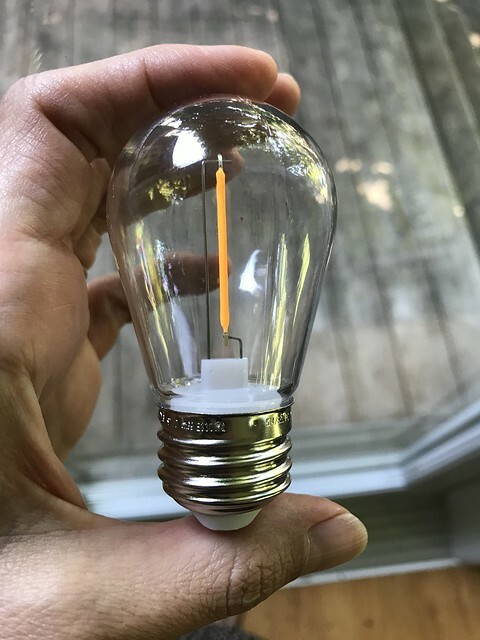 I think Mark is worried it’s a tad TOO bright because he offhandedly mentioned that he was researching outdoor dimmers, but I don’t think such a thing exists. Sorry Mark. Don’t get me wrong, I’m not quite done here. I’m still thinking about buying a few tiki torches and lighting up our table-top lanterns from Ikea to add even MORE light, but I think this is a very good start. To see other Things I am Loving, click here. 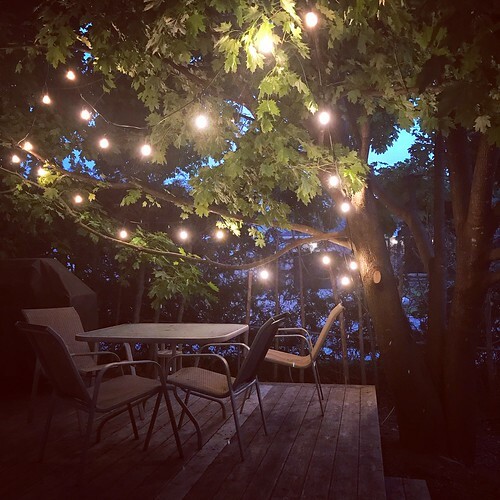 Share the post "Things I am loving: our new patio lights"
5 Responses to "Things I am loving: our new patio lights"
Since the picture looks amazing, I can’t imagine how beautiful it must look in person! Mmm did you get Mother Butter’s “Da Mix”? That’s my favorite Chicago Mix. I tried Popcornopolis’ similar mix and it did not even come close to Mother Butters in my opinion. So now what about #1 on your list? re: Chicago mix. I personally like the PC brand that has spicy popcorn in it! It’s totally addictive. And number one on the list will have to wait. There’s no budget for it at the moment and there are other things that need to take priority! Booooo! 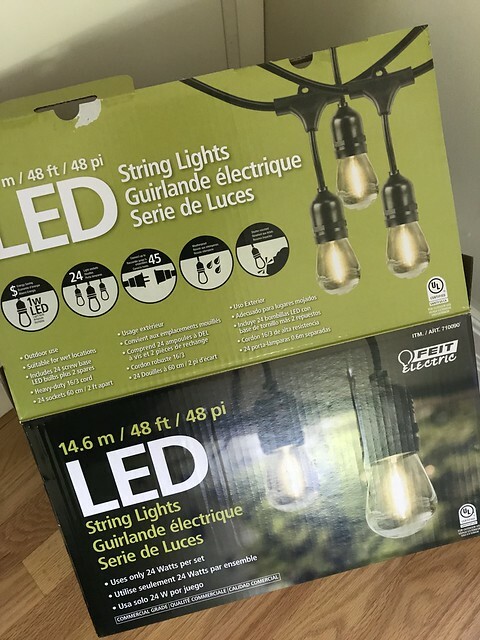 Thanks for the post, Andrea – that is exactly the sort of lighting I’ve been looking for too, but didn’t like the idea of incandescent bulbs. If I have to buy the Chicago mix for the complete backyard experience, then so be it! Fortunately our yard is well-situated so we won’t disturb our neighbours with the lights too much. 2014-04-24: A bit about Bluesfest School of Music and Art, plus a giveaway!